"Champagne Dreams for Truffled Times"
We would like to thank you very much for your co-operation and your consideration of Cinnabar Culinary Delights. Our founder, Paul Mesbur, passed away, peacefully and suddenly, on February 20, 2005. To honour Paul's memory, it would not be fair to continue the business he founded, as Cinnabar was comprised of his talent, his vision, and most of all, his taste. We appreciate your patience and understanding during this time of tragedy in our lives. In lieu of flowers, the families would prefer a donation be made to either Second Harvest, or the Canadian Liver Foundation, or the Canadian Diabetes Association. 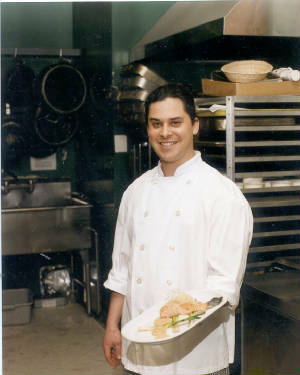 Chef Paul achieves "Iron Chef Beaujolais" status...read all about it!